I lunged as I whispered “GO!” My hands felt feathers, a body. A muscular, squirming body, anxious to escape my grip. I knew there was a head there, too, with a large, hooked bill, seeking to bite me and drive my hands and arms away. Somehow – I never really consciously know or remember how – my hands got some measure of control over the bird, usually with the neck in one hand and my other hand closing over a wing and the body, and I drug him or her into the tunnel with me. Other birds nearby croak and moan and click their bills, as cormorants will when agitated, but they stick tight to their nests. The bird’s mate is nearby, likely a bit confused, but fortunately decides to quickly cover up the chicks and keep them warm and safe. Meanwhile, I am wrestling with a large, angry bird in a dark, cramped tunnel. Did Lauren get a bird? I don’t have time to check. I scoot the bird’s body between my kneeling legs and hold him or her down with my body while one hand grips the head and the other hand reaches for a bird bag. I get the head in the bag and transfer control of the head to my other hand and begin sliding the bird’s body into the bag. Soon, I have the bird safely contained and ready for his trip through the tunnel to the blind at one end where he will get bands and a satellite radio transmitter. This is the second year that Karen is fitting cormorants at East Sand Island with satellite tags. 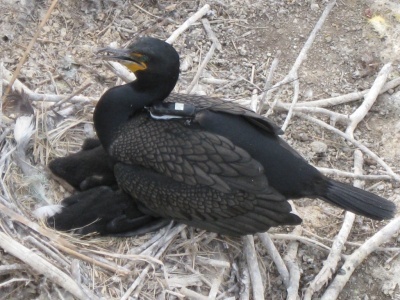 These tagged birds will provide some great information on post-breeding dispersal and potentially help us find some new cormorant colonies that we don’t know about. 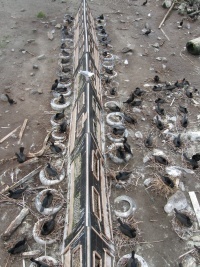 We’ve had tunnels through the cormorant colony for years, which allow us to access our blinds and collect data on cormorant nesting success and for other aspects of our research. 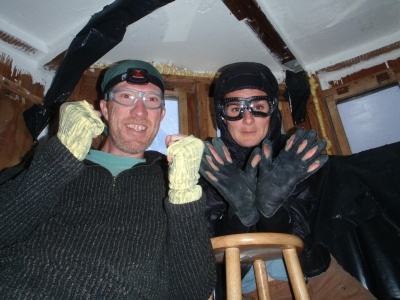 In the last couple of years a number of cormorants have nested right next to the tunnels and so we started cutting holes in the sides of the tunnels and covering them with fabric so we could reach out at night and grab cormorants. For the grabbers stationed in the tunnels, the process is a combination of tension (while waiting for just the right moment to reach out and grab), adrenaline (the grab and wrestle), and tedium (waiting for birds to be processed so we can grab more). The method has allowed us to grab and tag well over 30 birds now, with virtually no disturbance to the rest of the colony or other birds at East Sand Island – the cormorants on adjacent nests stick tight, less than five feet away!